Dough-nuts. S. Patterson 6 lbs. flour, part of which make into a sponge with a tea cup of yeast. 2 lbs. sugar 1 1/2 lbs. 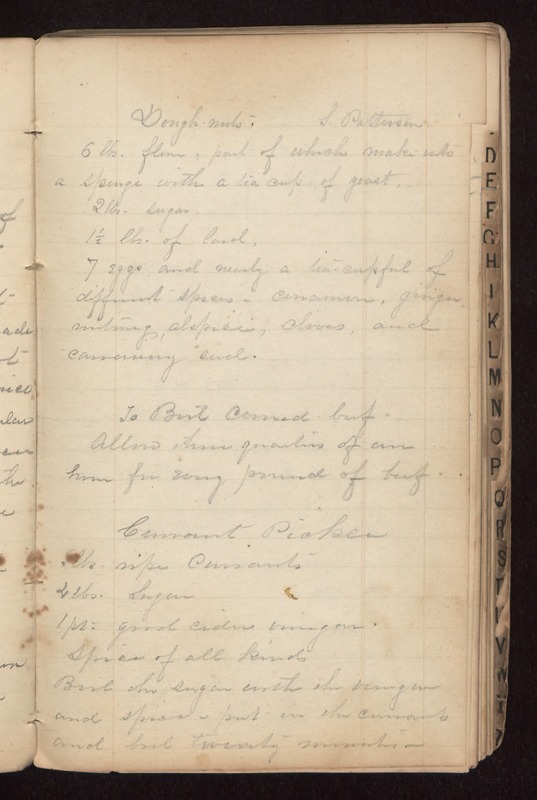 of lard, 7 eggs and nearly a tea-cupful of different spices, cinnamon, ginger, nutmeg, alspice, cloves, and carraway seed. To Boil Corned beef Allow three quarters of an hour for every pound of beef. Currant Picker [5?] lbs. ripe Currants 4 lbs. Sugar 1 pt good cider vinegar. Spices of all kinds Boil the sugar with the vinegar and spices & put in the currents and boil twenty minutes.